My name is Evangelos Souglakos and I live in Athens, Greece. I work as a Unix Systems engineer. Except for astronomy, my interests consist of photography, playing the piano and keyboards, and, of course, computer science. 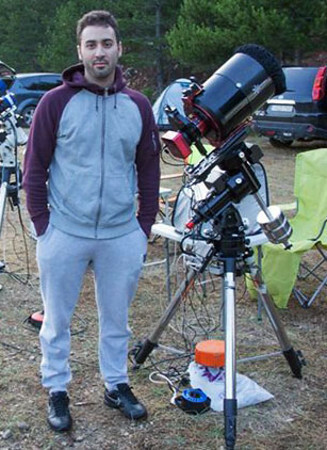 My astronomical observations and astrophotography usually take place in my country house which is situated a few kilometers outside Gythio, in southern Greece. The sky there is very dark, clear and, on most nights of the year, free from visible light pollution. Since my early student years I have had a passion and an inclination for science and, in particular, physics. My constant attention and study of any publication I came upon, which referred to celestial bodies, planetary orbits and, generally, inconceivable to the human senses events that take place within the vast body of what we call the universe, sparked my imagination and thirst for knowledge and the understanding of what is out there! Phenomena such as black holes, births and deaths of stars, nebulae and distant galaxies, as well as theories on time travel at the speed of light had begun to fascinate me. Despite my ignorance of the names of the stars and constellations, I, from an early age, observed the night sky and allowed myself to be mesmerized by its magic. The thought of buying a telescope came about recently when I began to discover that amateur astronomy has made great strides due to technological development. About a decade ago, photography of celestial targets, which for years it seemed unrealistic to capture with amateur equipment, suddenly began to fill websites. The thought of framing deep sky objects in a picture with my equipment was enough for me to deal with astrophotography. My lack of experience and knowledge of new terms and techniques, as well as many years of a multitude of errors, made me understand how challenging astrophotography really is. cameras and ccd, computer image processing as well as an avid anticipation for the final image is something that will accompany me for a very long time!